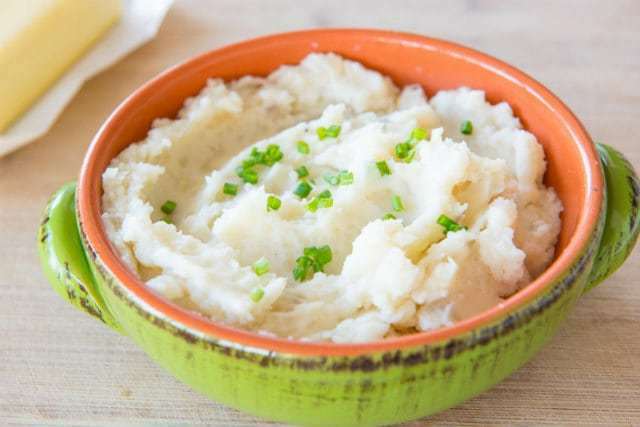 Though I love mashed potatoes, I’ve always thought of them as a fairly laborious thing to make. Peel all the potatoes, cut them into chunks, bring a big pot of water to a boil, boil the potatoes, drain the potatoes in a colander, put them all through a potato ricer, then mix in the cream and goodies. It’s all simple, but it undoubtedly takes time to make, and I actually ended up skipping them altogether this past Thanksgiving and making Potato Gratin instead. In my everlasting quest to use my slow cooker more, these days, when I want my mashed potato fix, I’ll make them in the slow cooker instead. I cut potatoes into chunks, then throw them into the crockpot for a few hours, mash with a fork and stir in the cream and goodies. It feels so much easier than the previous way I made them, and certainly makes much less of a mess. Less dishes is always an extra win.